Just like how Boo from masak-masak complained bout the weather, I am here to do so too. Luckily recently the weather is cooling down, but few days before it was like living in the middle of volcano. The sun was so scorching hot I sometimes believe my hair would sizzle if I stay any longer outside. The air was like the oven heat after a lovely muffin bake. The only think one can think of every time we are out, even in the car, is something really cool, better yet icy to drink. 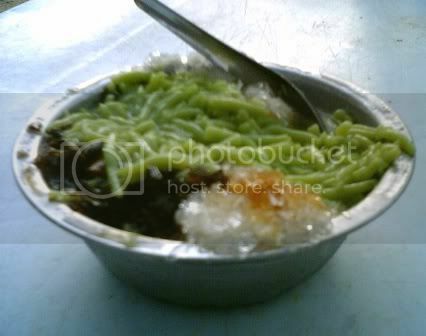 At times I would go for ais kacang, but for this time, we are attracted to another local icy drink, cendol. Oh yes, cendol is actually a type of dessert, I believe from Indian origin, very popular and authentic to Malaysia culture. It usually consists shaved iced, with green cendol (this is the thin worm like pandan flavoured flour noodles) drown in coconut milk and drizzled with gula melaka (this pair seem to be in every local dessert). The usual fillings would be red beans, cincau, jellies, kacang and sometimes glutinous rice. Cendol is really unique in taste, the gula melaka (the most important ingredient here in my opinion) and coconut milk blends real well, along with the smooth worm-cendol and the rest of the fillings is great. The shaved ice completes this drink to be the ultimate thirst quencher and body cooler. 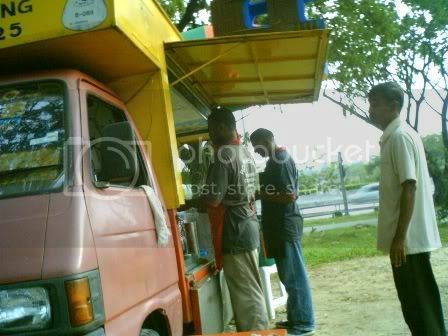 As for the one I’m talking about is the one at Taman Megah. We were just driving home on Sunday midday, cooking in our Proton oven (our national car) and we just had to stop by this stall to cool down before out insides boil over. The cendol here is really good, but I have yet to try the pasembor or rojak. Compared to the one in Taman Bahagia, this is more superior, but according to J, the rojak in the former is better. Oh well, you cannot get the best of everything at one go. After our cendol fix, we head home with smiling faces, and paid no heed to the crazy weather.